From London to Warsaw and Tokyo: Flo Bullough and Marion Ferrat discuss some of last month’s hot topics in the climate and policy world. 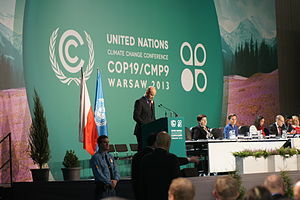 The UN’s Climate Change Conference in Warsaw concluded this week at the end of a 30-hour deadlock in decision making over the wording of the final deal. After a series of controversies including hunger strikes, walkouts and standoffs the meeting ended with the a deal hammered out. Countries have until early 2015 to publish their plans on curbing greenhouse gas emissions. There was also much discussion over the ‘Loss and Damage’ framework: delegates agreed to set up a compensation mechanism. Under the agreement, countries will receive some aid if hit by natural disasters but developed countries won’t be considered liable, and the fund won’t start functioning until 2020, the Guardian reported. See the link for more information. On the back of the conference, Nature published an editorial reviewing the state of the world’s climate targets. Despite certain drawbacks and the general gloomy feeling about political action on climate change, they concluded: “there is reason for hope”. House of Lords Chamber. Source – UK Parliament, Wikimedia Commons. Earlier in the summer, the House of Lords Science and Technology Committee launched an inquiry into Scientific Infrastructure. The inquiry was launched to collect evidence on large and medium-sized scientific infrastructure currently available in the UK. It aimed to consider the future needs and strategic planning, funding and governance arrangements, international partnerships and partnerships with industry. The final report for this inquiry has now been launched and highlights the following geo-relevant areas. 20 things policy makers need to know about science and 20 things scientists need to know about policy-makers! 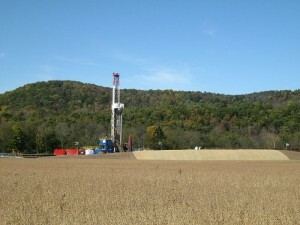 Science and policy have collided on contentious issues such as shale gas, these tips attempt to help both sides of the process! Source – Ruhrfisch, Wikimedia Commons. British and Australian scientists put together a list of tips that could help policy-makers and politicians which was published in Nature. These include the importance of bias sample size, randomization and data dredging. By way of response, there was also a ‘Top 20’ of things scientists need to know about policy making written by Chris Tyler at the Guardian. The Japanese government has scaled back its emissions targets after deciding the 25% reduction was too unrealistic. The shift back to coal, oil and gas for power following the Fukishima disaster has hindered recent progress in reductions. In line with the ongoing interdependence between water and energy, the United States Geological Survey announced they are to start reporting water usage during thermoelectric power generation in order to quantify the contribution of this energy source to the overall use of water. 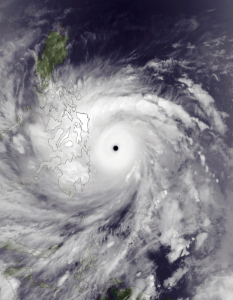 Satellite image of Typhoon Haiyan. Source – NASA, Wikimedia Commons. Typhoon Haiyan hit Southeast Asia in early November: an exceptionally powerful tropical cyclone that devastated portions of Southeast Asia, particularly the Philippines, It is the deadliest Philippine typhoon on record,killing at least 5,632 people in that country alone. There has been much discussion about the sometime assumed contribution of climate change to the disaster although this is rejeteced by many scientists. 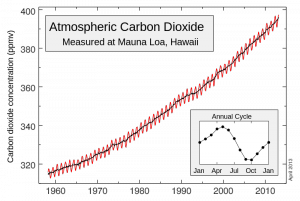 The Scripps Institution of Oceanography in California is seeking donations to maintain the historic ‘Keeling Curve’; a 55-year record of rising CO2 levels following years of lack of funding. 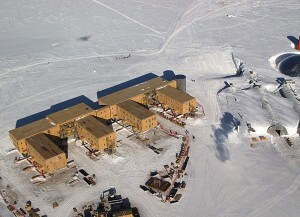 Amundsen-Scott South Pole Station. Source – U.S. Antarctic Program, National Science Foundation. The first high-resolution proxy for Arctic sea ice cover has been discovered. 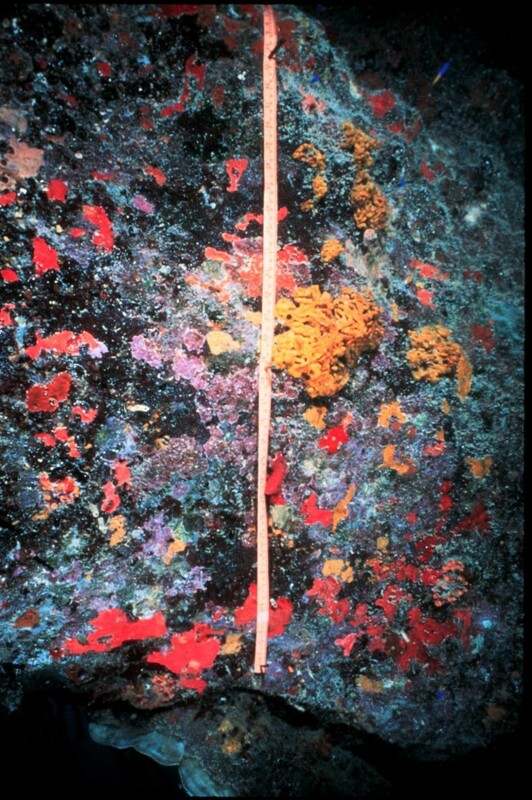 Demosponges and coralline algae – Source: K. Rasmussen, Wikimedia Commons. Long-lived algae living on the Arctic seafloor and build up as tree-ring-like structures on calcified rocks and record centuries of sea-ice history. Their sensitivity to both water temperature and sunlight is reflected in the algae’s growth rates and Mg/Ca ratio. The 646-year record discovered shows that sea-ice cover has seen the steepest decline in the past 150 years, with the 20th century characterised by the lowest area of sea-ice since the 14th century. High-resolution palaeo-records of Arctic sea-ice are crucial to assess pre-anthropogenic changes in ice cover and complement the satellite observation data available for the last few decades only. Proc. Natl Acad. Sci. USA http://doi.org/p6g (2013). Human activities are responsible for temperature changes in the 20th century, a new study has shown. Francesco Estrada and his team used state-of-the art statistical methods to assess the link between temperature, radiative forcing and CO2 emissions over the past century. They showed that temperature changes have been largely driven by atmospheric CO2 concentrations, with a pronounced increase around 1960. The results also revealed that human activities have driven periods of global warming slowdown, such as the warming ‘hiatus’ observed since the 1990s. Their study shows that reducing greenhouse gas emissions is an effective way to curb short-term climate warming. 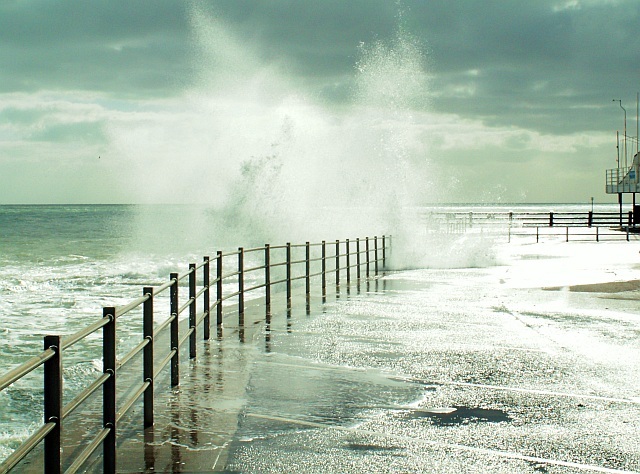 Sea spray on Broadstairs Pier – Source: Rose and Trev Clough, Wikimedia Commons. on cloud radiative forcing, and therefore climate change. A study published in Nature showed that uncertainties in the emissions of natural aerosols such as volcanic sulphur dioxide, biogenic volatile organic carbon and sea spray account for almost half of the variability of modelled aerosol radiative forcing. The results demonstrate the importance of understanding the effects of aerosols on climate in pre-industrial environments, where the impacts of natural aerosols can be studied in detail. This will be important to subsequently reduce model uncertainties of radiative effects in present-day polluted environments. Radioactive waters, Four Degrees – Marion writes on how radioactive elements make their way to the world’s oceans – and how scientists can use them to study important processes that go on in our waters. Dead Sea, Ein Boqeq. Source – xta11, Wikimedia Commons. how it fits in with the region’s complex geopolitics. Geo-Talk on GeoLog – Flo talks about policy and science communication on GeoLog. Geology for Global Development – GfGD posted a piece on the role that both science and academia have in successfully bringing together stakeholders in areas where co-operation is essential, but challenging in areas such as Afghanistan, Pakistan and Iran. Professor Thomas Stocker at the Grantham Institute Annual Lecture, Imperial College London – Source: Marion Ferrat. 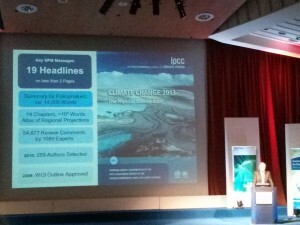 Four Degrees went down to the Grantham Institute for Climate Change Annual Lecture at Imperial College London last week, given by Professor Thomas Stocker, co-chair of the IPCC working group 1. He gave a very thorough and clear talk about the latest IPCC report and the importance of climate targets with a clear message that we need to act now to tackle climate change. Imperial College news: Act now to limit climate change says climate expert at Grantham Annual Lecture: 1http://www3.imperial.ac.uk/newsandeventspggrp/imperialcollege/naturalsciences/climatechange/newssummary/news_28-11-2013-11-8-22. Professor Stocker also talks about the public perception of climate change and many aspects of the IPCC report in this Nature Climate Change interview. As the decommissioning of the damaged Fukushima nuclear power station begins, Marion Ferrat takes a look at how radioactive elements make their way to the world’s oceans – and how scientists can use them to study important processes that go on in our waters. 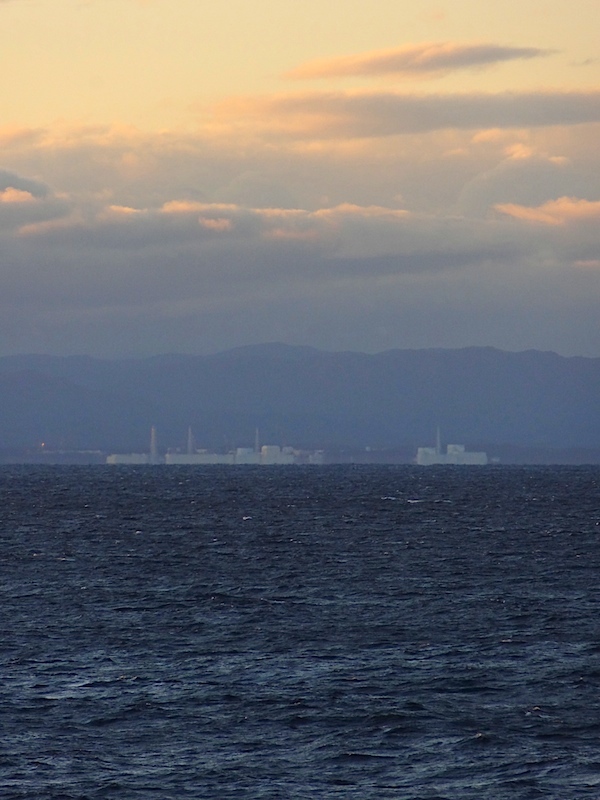 Fukushima Dai-ichi nuclear station – Source: Asacyan, Wikimedia Commons. Early last week, work began to remove spent fuel rods at the disused Fukushima Dai-ichi power station, more than two years after the plant suffered a triple meltdown caused by the powerful earthquake and tsunami of March 2011. Over 1,500 fuel assemblies will be removed over the course of one year, but decommissioning of the entire site will take decades. Like Chernobyl before it, the Fukushima disaster released large amounts of radioactive elements to the environment, many of which made their way into natural waters. But such accidents are not the only sources of anthropogenic radionuclides – the radioactive products of nuclear reactions – to the environment. Radioactive elements have also been released from nuclear reprocessing plants, as well as from the hundreds of nuclear tests that took place between the 1940s and 1980s. In this post, I want to explore what happens to these radioactive elements when they enter the aqueous environment, and how oceanographers use them as unique tracers to study ocean circulation patterns. Where does the radioactivity come from? This is what is called global nuclear fallout. Radioactive elements released during the hundreds of cold war weapons tests fell back into the oceans after the detonation of the nuclear devices. 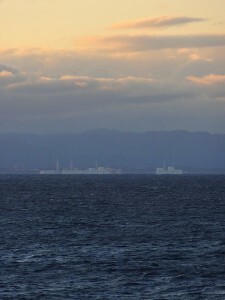 As most of the tests were carried out in the Pacific, this ocean became the largest repository of radioactive fallout. Only the longer-lived isotopes released from these tests remain in the environment today. The accident released 400 times more radioactive material than the Hiroshima bomb and is considered the worst nuclear accident in history. Adjacent regions in Belarus, Ukraine and Russia were the worst hit but a radioactive cloud travelling westward also contaminated many regions of Europe, the North Sea and the North Atlantic Ocean. 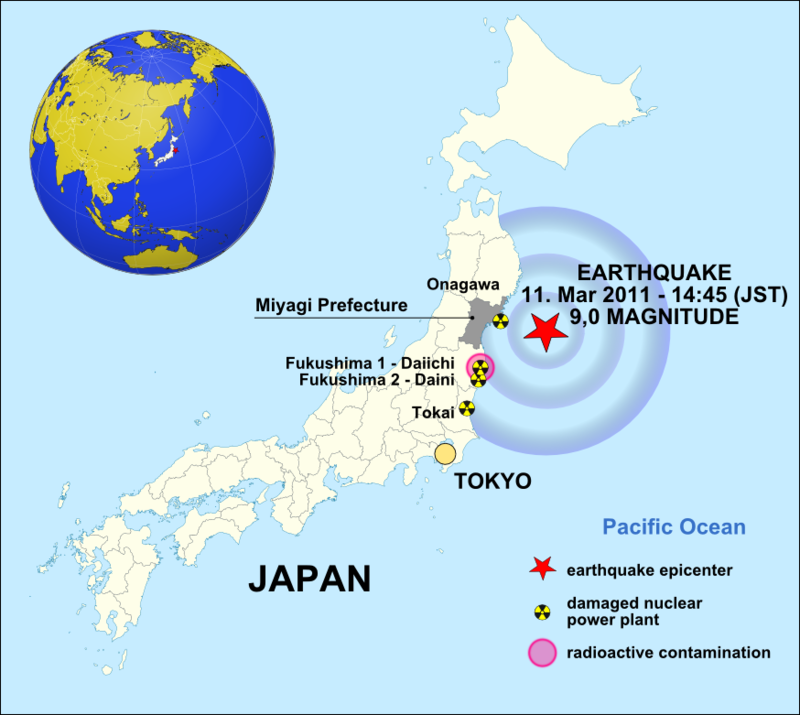 The Japan earthquake of 11 March 2011 – Source: Maximilian Dörrbecker, Wikimedia Commons. The tsunami generated by the Tōhoku earthquake of 11 March 2011 damaged the Fukushima nuclear facility, leading to equipment failure and a subsequent nuclear meltdown. This accident released between 10-30% of the radiation caused by Chernobyl. Fukushima and Chernobyl are both classified as level 7 (the maximum level) in the International Nuclear Event Scale. Nuclear reprocessing plants involve the extraction of plutonium and uranium from used nuclear fuels. 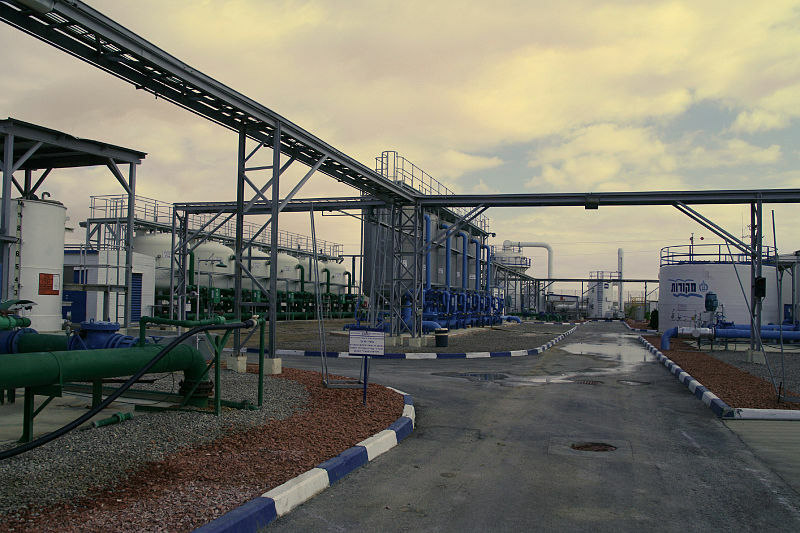 The chemical processes involved generate large quantities of waste, which makes its way into the environment. 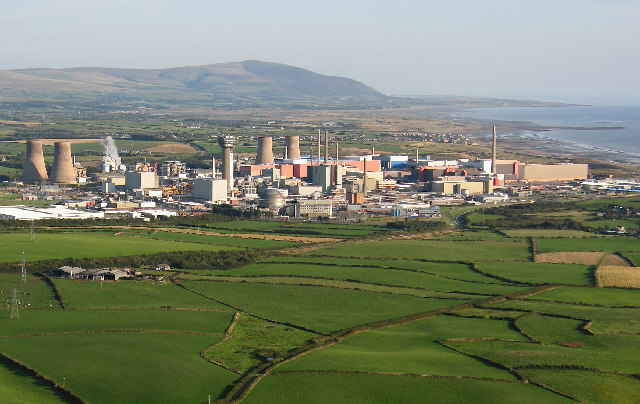 Authorised releases from facilities such as Sellafield in Cumbria and Cap de la Hague in France have contributed to the contamination of the Atlantic Ocean and Irish Sea. Though discharges have been heavily reduced since their peak in the 1970s and 80s, these can still be observed in the environment. The Centre for Environment, Fisheries and Aquaculture science (CEFAS) releases annual or multi-annual environmental monitoring reports assessing the impact of this contamination in Britain. 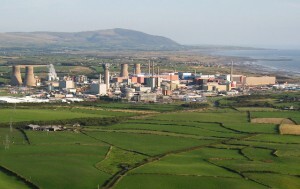 Aerial view the Sellafield nuclear reprocessing plant in Cumbria – Source: Simon Ledingham, Wikimedia Commons. What are the main radionuclides in waters today? A whole range of radioactive elements are released from these different sources. While some radionuclides produced are very short-lived (they decay with half-lives of hours to days), others can remain in the environment for tens to tens of thousands of years. The main radioactive isotopes from these sources found in the oceans today include tritium (3-H), radiocarbon (14-C) and isotopes of strontium (90-Sr), technetium (99-Tc), caesium (134-Cs and 137-Cs) and plutonium (239-Pu and 240-Pu). They have half-lives ranging from 2 to 200,000 years. These radionuclides are the most commonly studied both for monitoring (because of their radiological impacts) and research purposes: as it turns out, radioactive waters have a lot to say about the ways our oceans work. 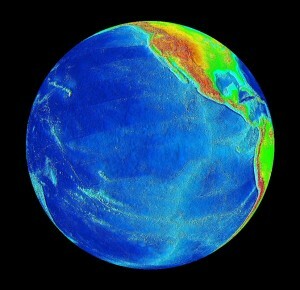 Anthropogenic radionuclides are very strong tracers of oceanic, biogeochemical and sedimentary processes. Once they make their way to the waters, they don’t just sit there; they swim, they sink, and they behave in a variety of different ways. Because some of these radioactive isotopes were absent from the natural environment until the mid 20th century, they only have a relatively small number of possible sources and can act like “fingerprints”, pinpointing the movement of particular water currents. So scientists can sample ocean water on large research ships, look at radionuclide concentrations in the water today, and see how far they have moved around in the oceans. There are two types of interesting radionuclides: those that dissolve in the water, such as tritium or caesium, and those that react with particles, like plutonium. These two types of behaviour allow oceanographers to study different oceanic processes. The Pacific Ocean – Source: NASA, Wikimedia Commons. Soluble radionuclides are useful because they get transported with water masses: where the water goes, the radioactive element follows. 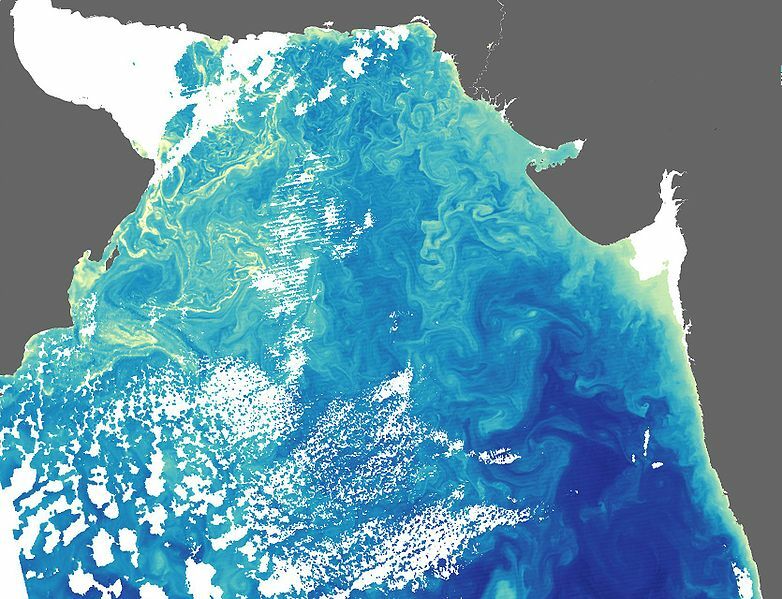 Because scientists know with relatively high confidence where the elements entered the water, they can look at how ocean circulation has re-distributed them worldwide. For example, high caesium concentrations were recently found in the Tasman Sea. These must have come from elsewhere as very few nuclear tests were carried out in the Southern Hemisphere. Scientists were able to trace this caesium back to its source in the North Pacific Ocean, allowing them to study in detail the way that Pacific waters get transported across the equator over decades. Particle-reactive elements like plutonium are equally useful. They will tend to attach themselves to larger particles (what is called being scavenged) rather than dissolve in the water, so they will slowly sink to the bottom of the ocean along their transport route. A few years ago, scientists from the Marine Environmental Laboratories of the International Atomic Energy Agency in Monaco carried out a global study of plutonium in the oceans of the southern hemisphere. They found that plutonium from the North Pacific region had made its way to the South Pacific, through to the Indian Ocean, and onto the South Atlantic. They also noticed lower and lower concentrations in the surface waters along the way, so they were able to study both the exact route of water transport, and the rate at which particles in the ocean scavenged this plutonium. Though these radioactive elements are clearly present in the waters, their concentrations once they have travelled the world can be extremely low. This is a challenge for oceanographers wanting to measure them, because instruments cannot detect radioactivity below a certain level and measurements can be hampered by other sources of radiation. So scientists need to sample enough water to be able to confidently determine the radioactivity of their target radionuclides. 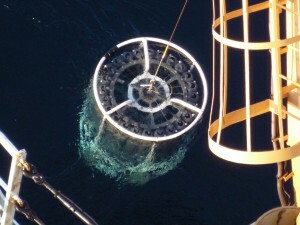 A rosette system for sampling seawater from research vessels – Source: NOAA Photo Library, Wikimedia Commons. For tritium, this is relatively straightforward as it is present in high enough concentrations (but with little radiological impact). Approximately 1L of water is sufficient to determine its activity. But other radionuclides, such as technetium or caesium, have typically required up to hundreds of litres of water for one sample. This, of course, is problematic when sampling on a research ship: space is quickly taken up by huge containers of sampled water, and all of this water gets very heavy! 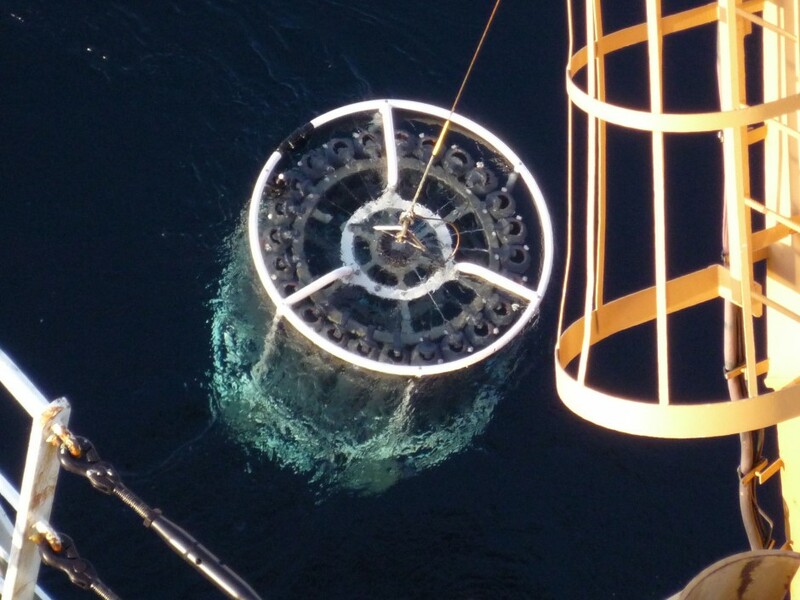 Until recently, sampling ships have had to restrict themselves to certain elements or to a small sampling area in order to cope with the large volumes of water required. Recent developments have allowed scientists to get around some of these problems. Radionuclides can be pre-concentrated on board the ship with clever feats of chemistry: the sampled water is passed through pumping systems containing certain reagents that ‘fix’ the radionuclide of interest (for example caesium), removing it from the bulk of the water. Once this is done, the remaining water can be emptied back into the ocean. Developments in detector efficiencies and new ‘radiation-proof’ underground laboratories have also substantially increased the sensitivity of instruments and allowed the determination of important radionuclides in samples of tens rather than hundreds of litres. Most of these radionuclides entered the oceans nearly half a century ago (this interesting video gives an idea of the scale of cold war nuclear testing over the Pacific Ocean). They will continue to decay with time and some will eventually disappear in a few decades. The longer-lived isotopes, however, will continue to swim the oceans for thousands of years to come. In any case, scientists will be able to use these nuclear products to study the world’s oceans. The Dead Sea is one of the planet’s truly otherworldly places: a peculiarity of water distribution, climate and altitude, it is even more extroadinary in that it is a site of religious, cultural and political significance. Viewed by many as a natural wonder, its characteristics and location within one of the most entrenched political situations in modern history makes it intriguing and troubled in equal measure. The Dead Sea is the deepest hypersaline lake in the world, situated at the lowest point on earth. It has a salinity of 33.7% due to high concentrations of NaCl and other mineral salts. The Dead Sea, aside from being a misnomer (it is actually an inland lake) is so-called because of the harsh living conditions that the salinity engenders. Many organisms such as fish cannot live there, in fact only populations of bacteria and microbial fungi can thrive. Located in the Jordan rift valley bordering Jordan to the east, and Israel and Palestine to the west, it is served only by the Jordan River to the North. A combination of the mineral content of the water, low content of pollens, the reduced ultraviolet component of solar radiation and the higher atmospheric pressure at this depth have specific health effects which have borne a booming spa-tourism economy. This along with the dramatic scenery and tranquil waters is why it has long been a site of tourism and refuge; King David used it as such and it was one of the world’s first health resorts for Herod the Great. There are two schools of thought as to how it formed; one is that the depression forms part of the East African rift valley complex and, another more recent hypothesis describes the formation as a ‘step over’ discontinuity along the Dead Sea Transform creating an extension of the crust. The sea was once connected to the Mediterranean and experienced regular flooding, resulting in thick layers of salt deposition. The land between the Mediterranean and the Dead Sea subsequently rose to cut the basin off and create a lake. 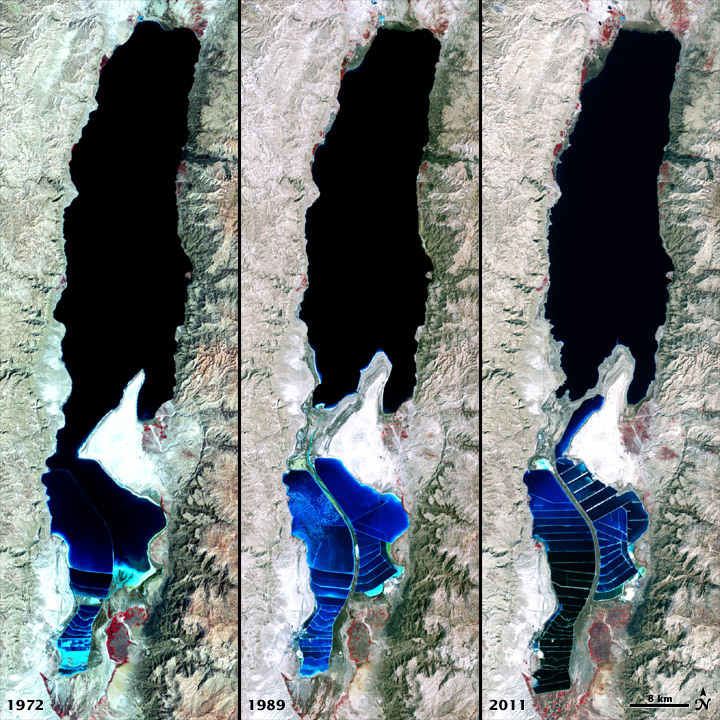 The Dead Sea in more recent years has been characterised by a decline in water levels, a drop of ~30m since 1960 alone and is currently shrinking by around 1m/year. This is in part due to a drop in rainfall and the use of water upstream of the Jordan river for irrigation projects. 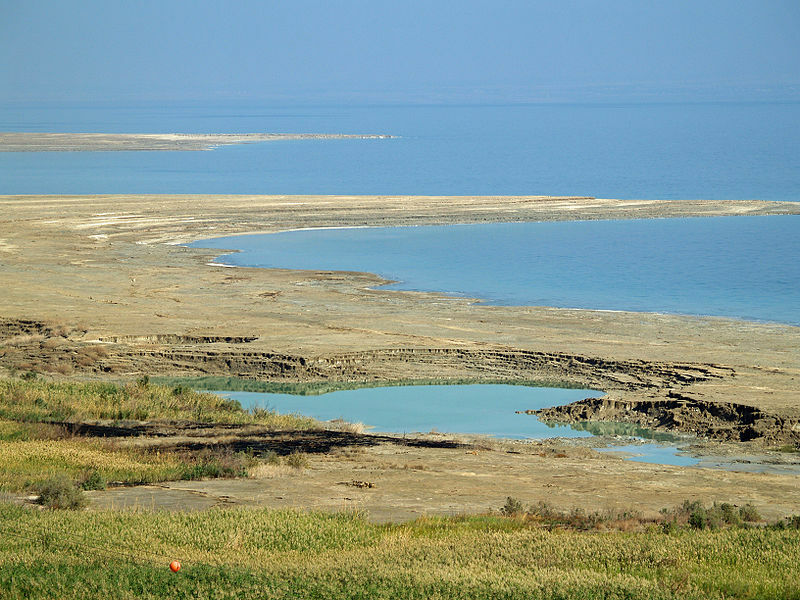 Declining water levels have resulted in a wide variety of environmental issues for the Dead Sea ecosystems and surrounding region. One such issue is the ever-feared rumble that precedes the formation of sinkholes; these can be unpredictable and can occur suddenly almost anywhere in the Dead Sea region. Indeed, the level of uncertainty and rapidity of sinkhole formation is such that around 10 years ago, renowned geographer-geologist and expert on sinkhole phenomena Eli Raz was swallowed up by one and waited 14 hours for rescue! Sinkholes in the Dead Sea area are caused by the interaction of incoming freshwater with subterranean salt layers. As the sea level drops, high levels of salt are left behind in the soil and when freshwater washes in from the Jordan River it dissolves the salts and cavities are created. This process continues until the subterranean structure loses integrity and sinkholes are formed. It is estimated there are now about 3000 in the region of the dead sea with an opening up of around 1 a day. Sinkholes along the shore of the Dead Sea. Source. Why is the water level dropping? Jordan, Syria, Palestine and Lebanon have all tapped the Jordan river for water over the last few decades for irrigation purposes resulting in a reduced flow into the Dead Sea. An area with historically low rainfall, ~ 2 inches a year, enormous amounts of water is also piped off to fill evaporation pools for the potash and magnesium industries which sit at the very southern end of the sea. This alone is thought to result in a 30-40% reduction in water. In the last 50 years, the population in the surrounding countries of Israel, Palestine and Jordan has increased from 5.3 million to over 20 million with an increase in the settled population in the Dead Sea region. Currently, tens of thousands of tourists visit every year to bathe in the sea and use the many resorts and spas found along the shores and visit the mighty ruin of Masada (including me!) that overlooks the Dead Sea. Tourism is growing in this area and makes up about 40 percent of the income of local residents and this is putting further pressure on diminishing water resources. 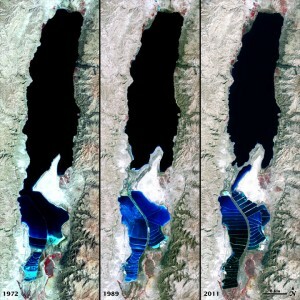 Views of the Dead Sea in 1972, 1989, and 2011 compared. Source. 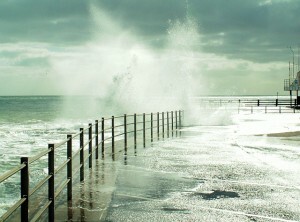 How can environmental catastrophe be avoided? The delicate balance of inflows, outflows, evaporation and rainfall has been severely disturbed in the last 50 years, and this hasn’t gone unnoticed. A highly ambitious project is underway to replenish the Dead Sea and ameliorate some of the water and energy shortage issues in the region. The World Bank, together with the local governments is planning to create a canal linking the Red Sea to the Dead sea. The project includes a series of studies including feasibility, environmental and social assessment with the aim of generating a trilateral agreement between Palestine, Jordan and Israel. If the plan goes ahead as detailed, the pipeline will deliver 2 billion cubic metres of sea water per year from the Gulf of Aqaba through Jordanian territory and to the Dead Sea. The plan is to also use the downwards flow between the Red Sea and the Dead sea to incorporate a hydroelectric plant. This is in turn will power a desalination plant which would provide up to 850 million m3 of fresh water per year to a water parched region. 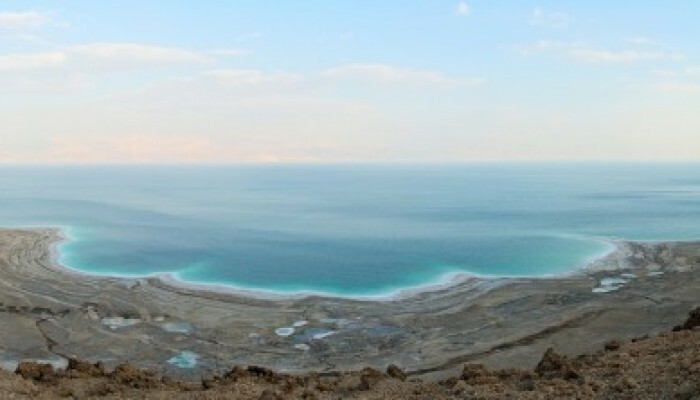 The briny discharge from the desalination plant would then be discharged into an already-saline Dead Sea. The project is likely to cost at least US $10 billion, a significant proportion of this is taken up by the cost to pump the desalinated water 200km over an altitude change of 1000m from the Dead sea towards Amman, an extremely parched area. Algal Blooms in the Arabian Sea. Source. So, it sounds good but is it really that simple? 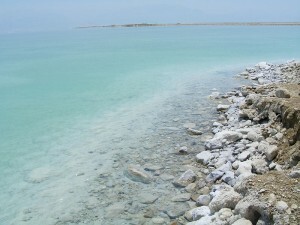 Many studies find that if more than 400 million m3 of sea water is added to the Dead Sea, this could result in the formation of algal bloom and unsightly gypsum crystals, the effects of which have effects that are difficult to predict, this will impact on the image and chemistry of the Dead Sea. Although the ecological effects of these chemical changes are still unclear, they would likely diminish the sea’s tourist appeal. This is in addition to the fact that the amount of water supplied would not be enough to stabilise or increase the level of the Dead Sea. There is also concern about the effects of mixing Red Sea water with Dead Sea water. Many other alternatives have been mooted by environmental groups, such as water recycling and conservation by Israel and Jordan, importing water from Turkey and desalinating sea water on the Mediterranean coast. Whilst pumping desalinated sea water from the Mediterranean to Ammam would be easier and cheaper, the geopolitics are concerning. Many worry that Israel would control the supply to Ammam. Another very real concern is the high frequency of earthquakes in the region, seismic activity could cause salt water to leak into underground fresh water aquifers. Others would prefer to see the rehabilitation of the Jordan River with a greater utilisation of desalination to provide water to the Mediterranean coast. All of these alternatives however require cooperation and a regional approach to water sharing which is difficult in this part of the world to say the least. This issue sits within a wider problem. This is a region with extremely low levels of rainfall and a booming population. Jordan are well behind the Red-Sea-Dead-Sea project largely because the country’s access to fresh water is extremely restricted, which has been exacerbated by the arrival of more than a quarter of a million Syrian refugees since the outbreak of the civil war. Nitzana desalination plant in Israel. Source. Israel has long had issues with water scarcity. Due to low rainfall and a booming industry, the demand on water outstrips conventional water resources. This is put under further strain from the water-intensive agricultural practices used throughout the country.This is in part alleviated by their technologically advanced desalination plants dotted along the Mediterranean coast. Gaza, on the Mediterranean coast is thought to be heading for a serious water crisis in the coming decade with 90-95% of the main aquifer contaminated, the UN suggest the water might be unusable by 2016. Meanwhile water shortages in the West Bank affect the provision of drinking water, water used for farming and agriculture in addition to that required for basic sanitation. The regional geopolitics is intensely complex with many historic and current political factors at play. Others can write much more authoritatively on the area but it is worth mentioning here because, as with many geological issues, the interplay between the two is important. The main regional players are Israel, Palestine and Jordan. Jordan, with few freshwater resources and no oil to power desalination plants, has long been considering an engineered solution to alleviate the water issue in Jordan. At peace with Israel since the signing of a treaty in 1994, the Jordanian government is hoping the plan goes ahead in full. Israel and Palestine are significantly more complicated. 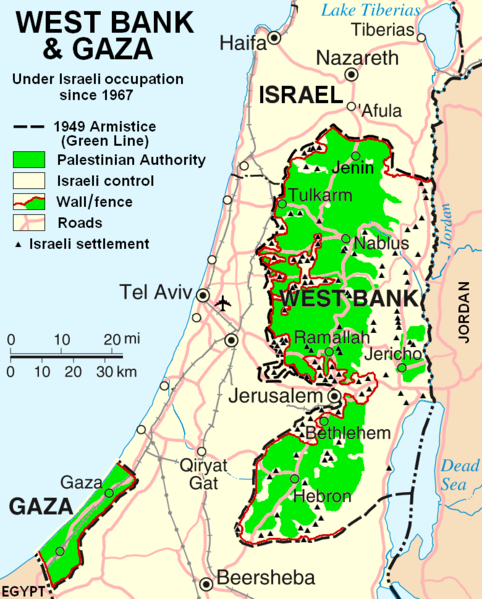 The current de facto borders of Israel and Palestine are broadly along the lines drawn following the ‘Six Day War’ in 1967, as seen in the image, where Israel extended its borders and captured, among other territories, the West Bank. Map of the West Bank and Gaza Strip. Source. Contemporary Palestine now exists as two non-coterminous territories: the Gaza strip, which is on the Mediterranean coast (run by Hamas) and whose borders are controlled by Israel and Egypt, and the West Bank (the name of which refers to the Jordan River) which borders Israel to the north, south and west, and Jordan to the east. Civil and military authority in the West Bank is a mixture of the Fatah-led Palestinian Authority and the Israeli state. The Dead Sea spans the south east corner of the West Bank, as well as parts of Israel and Jordan. Whilst the West Bank shares a geographical border with Jordan, this is controlled by Israel, and the West Bank remains under Israeli occupation under international law. In a region with scarce water resources, distribution can be controversial – and Israel’s monopoly over a shared aquifer and access to the Jordan River has resulted in the state being accused of restricting access to water for Palestinians. Palestine (despite divisions in governance across the two territories) is still seeking independent statehood, and in 2012 was recognised at the United Nations as a ‘Non-member observer state’. As such, negotiations over multilateral initiatives such as the Red Sea-Dead Sea project have enormous geopolitical implications. There are many examples of delicate border regions which cut across natural river systems, such is the nature of modern national borders, they very rarely follow catchment areas and as such control over and use of water bodies can be highly contested. Cross boundary water engineering negotiation goes on in many areas around the world and these often intersect with political and environmental issues. In addition to the Dead sea and Jordan river the Nile is subject to boundary issues, running through Egypt, Sudan and Ethiopia. Egypt and Ethiopia are currently negotiating over a billion dollar dam project being built in Ethiopia. Egypt are looking to help with the construction of the dam project. The Caspian Sea has also had more than its fare share of water-rights disputes. A massive sea in Central Asia, its issues descend from the break up of the Soviet Union in 1991 and thus increasing the number of countries with an interest. As such a number of plans have been proposed and rejected due to lack of unanimity leaving the legality and governance of the area up in the air and resulting in resource grabs and export of resources struck without agency. 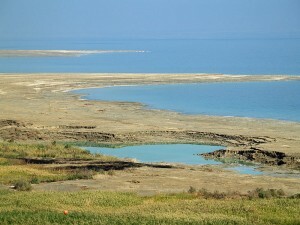 As with the Dead Sea, these examples show the great complexity in dealing with cross-boundary water management and no situation is the same, and must be dealt with carefully and on a case by case basis. We should start this post with a declaration of interest. 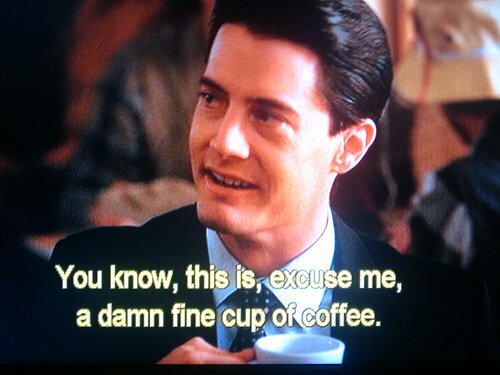 We absolutely love coffee. Whether it’s latte, macchiato, flat white (or cafe au lait for Marion!) we drink it everyday! So for our second installation of “What’s geology got to do with it?’ we’re going to highlight the connections between coffee and geology! As well as being absolutely delicious (and often powering an entire community of researchers, PhD Students, lawyers etc through work on a daily basis!) coffee is the 2nd most traded commodity in the world, sitting in a list dominated by other commodities important to geoscience! Coffee berries, a variety of Coffeea Arabica. Source – Marcelo Corrêa, Wikimedia Commons. 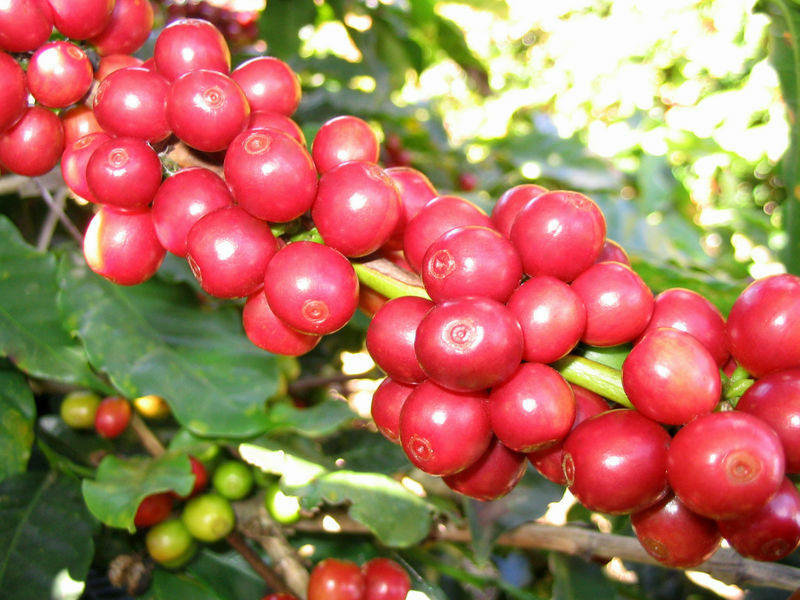 In order to supply the international demand for coffee, coffee trees require a large supply of nutrients. These nutrients are delivered through soils which are ultimately formed from the breakdown and erosion of rocks. In addition to allowing coffee trees to grow, the soil makeup will also contribute to a coffee’s unique flavour profile. Having said that, the combination of factors affecting taste is so complex, that even from a single plantation you can find variation in quality and taste. What does coffee need to grow? Aside from cool-ish temperatures (~20 degrees) and high altitude (1000-2000 metres above sea level), Coffee requires a wide variety of essential elements in order to grow and deliver the delicious stuff we drink. These elements are delivered through the soil profile. The usual suspects like Phosphorus, nitrogen, potassium, calcium, zinc and boron are all very important. The level of potassium influences total sugar and citric acid content while nitrogen is important for amino acid and protein buildup and can influence caffeine build up. Boron is important for cell division, cell walls and involved in several enzyme activities. It also influences flowering and fruit set and affects the yield. In addition to soil type and content, factors such as slope angle (15% is optimal), water supply (good supply with interspersed dry periods are essential) and altitude exert strong influence on the success of coffee growth. Coffee can be grown on lots of soils but the ideal types are fertile volcanic red earth or deep sandy loam. For coffee trees to grow it is important that the soil is well draining which makes heavy clay or heavy sandy soils inadequate. Some of the most longstanding and famous coffees are grown on the slopes of volcanoes or in volcanic soil, also known as ‘Andisols’. But why are they so fertile? This is due to how young, or immature they are as soils. They still retain many of the elements that were present during the formation of the rock, they haven’t been plundered over hundreds of years of agriculture, they haven’t undergone extensive leaching and are relatively unweathered. This means they often include basic cations such as Mg, Ca or K (which can be easily leached out) and often retain a healthy supply of trace elements. Whilst these soils are very fertile, they only cover around 1% of the ice-free surface area of the earth. They can usually support intensive use for growing coffee and other mass crops such as maize, tea and tobacco. Despite the high fertility of volcanic soils, many do need a nutrient top-up during the growth cycle that comes from natural manure or fertilisers, which are themselves in diminishing supply. Volcanic soils also have a good structure and texture for coffee growth as they often contain vesicles, which makes them porous and ideal for retaining water. Shallow groundwater is bad for coffee growing as it can rot the roots and it needs to be at least 3 metres deep. Roots of coffee have a high oxygen demand so good drainage is essential. Where does coffee grow and why? 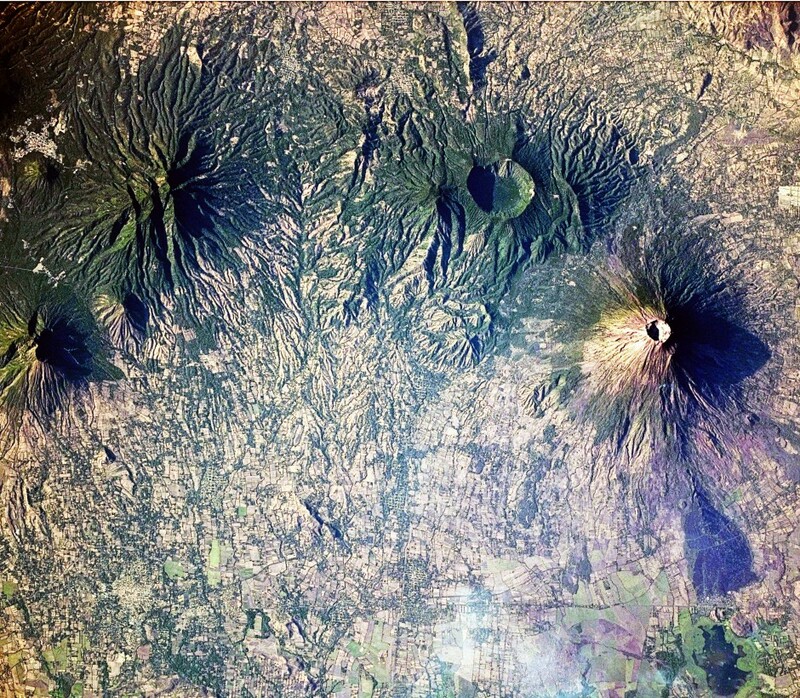 It is no surpise then that some of the most famous and historic coffee growing regions are in areas of past and current volcanic activity such as Central America, Hawaii and Indonesia. Coffee trees produce their best beans when grown at high altitudes in a tropical climate where there is rich soil. Such conditions are found around the world in locations along the Equatorial zone. Hawaii – coffee is grown in volcanic soil or directly in the loosened rock. The location and island climate provides good growing conditions. 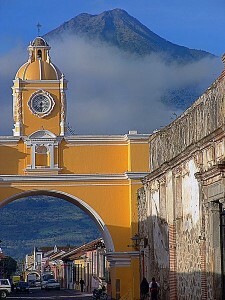 Volcán de Agua overlooking Antigua in Guatemala an area with a big coffee production industry. Source – Zack Clark, Wikimedia Commons. Indonesia – coffee production began with the Dutch colonialists and the highland plateau between the volcanoes of Batukaru and Agung is the main coffee growing area. Ash from these volcanoes has created especially fertile andisols. Colombia – thought that Jesuits first brought coffee seeds to South America. One of the biggest producers in the world, regional climate change associated with global warming has caused Colombian coffee production to decline since 2006. Much of the coffee is grown in the cordilleras (mountain ranges). Ethiopia – grown in high mountain ranges in cloud forests. Central America – rich soils along the volcanic range through central america, equatorial temperatures and mountainous growing areas make this a powerhouse in the coffee growing world. Like many crops and food commodities, good coffee requires good climate. For our favorite bean, this typically means temperate regions at altitudes of 1000-2000 m. But climate is changing and this is likely to have a big impact on coffee growth, and by association, on the livelihood of millions of local coffee farmers who rely on its production. In its latest report out last month, the UN’s Intergovernmental Panel on Climate Change (IPCC, the leading body assessing climate change impacts) confirmed for the 5th time what climate scientists worldwide already know: that our climate is warming as a result of human activities. Global temperatures have already risen by almost 1C since the end of the 19th century and will continue to rise at even faster rates over the coming century. There are two ways in which a changing climate will impact coffee growth and production. First, increasing temperatures or changes in precipitation will directly affect the areas suitable for coffee growth, leading to a loss in coffee growing environments. A coffee berry being chewed up by hungry Hypothenemus hampei – Source: L. Shyamal, Wikimedia Commons. Second, and perhaps most importantly, changing climate and higher temperatures will affect a little insect called Hypothenemus hampei (H. hampei for short). H. hampei is small but lethal. This beetle-like insect is what people call a coffee berry borer. It is the most important threat to coffee plantations worldwide. Born in central Africa, H. hampei began colonising coffee plantations worldwide with the global movement and commerce of coffee beans. H. hampei likes warm climates. Until about a decade ago, it was very happy munching away at low-altitude beans, below the preferred altitude of our beloved Arabica coffee (between 1200-2000 m in East Africa). But with rising temperatures, the berry borer can now survive at higher altitudes. On the slopes of Mt Kilimanjaro in Tanzania, H. hampei has climbed 300 m in 10 years. Mount Kilimanjaro – Source: Muhammad Mahdi Karim, Wikimedia Commons. H. hampei causes over $500 million loss annually in East Africa alone. 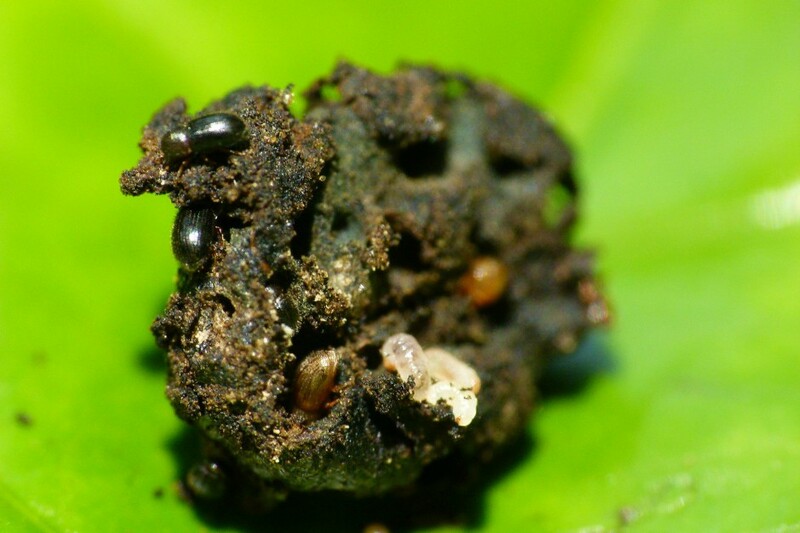 The borer is gaining both geographical extent (it is only absent from coffee plantations in China and Nepal, having infiltrated Puerto Rico in 2007 and Hawaii in 2010) and altitude. A further 1C increase will see the borer develop faster and gain new territories. 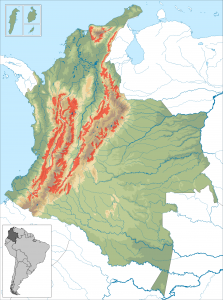 The Colombia coffee belt – Source: Instituto Geografico Agustin Codazzi, Wikimedia Commons. In Colombia, where coffee accounts for 17% of the total value of crop production, temperatures in the coffee belt region are projected to rise by 2.2C by 2050. This could both shorten the coffee growing season and allow the pest to make its way above 1500 m.
It has been estimated that Colombian plantations would have to be moved up by 167 m for every degree of warming. In East Africa, studies predict that Arabica coffee, currently grown at 1400-1600 m, will have to shift to 1600-1800 m by 2050 as a result of rising temperatures. But it is unlikely that East African coffee plantations will be able to adapt. For one, suitable high altitude habitats are not common. Second, population growth is likely to put a huge demographic pressure on arable land (the population in Ethiopia is set to double by 2050 – see this fact sheet by the Population Reference Bureau) and it is likely that the shrinking available arable land will be used to cultivate other crops over coffee. The impact of climate change on invasive pest species is something that ecologists are studying worldwide. Small changes in average temperatures can have huge bearings on where these pests live and what they feed on, and this seems to already be the case for the coffee berry borer. Let’s hope Flo and I can continue enjoying our weekly Four Degrees coffee meetings for many years to come!